Unless you've been living under a rock, you are probably aware by now that the U.S. federal government entered a new fiscal year yesterday, but that Congress hasn't given it any money. Outcome: government shutdown. Kind of. Mostly, but not entirely. The State Department is still operating, thanks to some budgetary wizardry I don't entirely understand involving multi-year funds, and will continue doing so until we run out of money. And when will that be? No one can really say for sure. But in the meantime we are still coming to work, still doing our jobs, and still getting paid, though I wouldn't exactly describe it as business as usual. My paycheck is safer than most, since my salary is financed not by tax dollars appropriated by Congress (when they can be bothered with such mundane tasks) but by fees paid by passport and visa applicants, "and since consular operations are fee-funded, there’s a significantly less chance of a furlough occurring for those departments." So that's great news for me, and also for all the American citizens in Ireland who might have their passport stolen or otherwise need my help between now and whenever Congress gets its act together. It's not so great for more than 1 million of my fellow federal employees who are coming in to work every day and doing their jobs for the benefit of the nation so they can get paid back...someday, later, eventually, once Congress pulls itself together and does its job. And then there are another 800,000 who are legally prohibited from doing their jobs until Congress decides to govern already and who may never get paid at all. I know a lot of people in both categories, and I worry for them, especially with the Washington Post predicting an extended shutdown before this thing gets worked out. They still have bills to pay. And from my weird little paycheck-in-a-shutdown Twilight Zone I have what you could call survivor's guilt. There, but for a quirk of funding mechanics, go I. But there's not a lot I can do to help. It's not up to me to fix this. It's up to a particular group of 535 bickering children representatives democratically elected to govern the nation in the best interests of its people. I find it difficult to believe that current events are truly reflective of that mission. 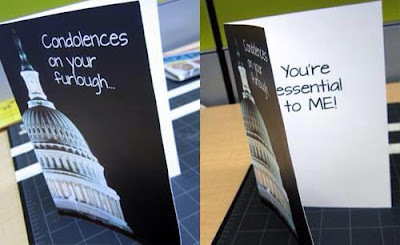 But this is all very depressing, so in an attempt at levity, here's a furlough card for all my friends staying home for the duration. Imagined by me and brought to life by a clever friend of mine with skillz. That card is amazing. It did just make me realize that I don't have access to a printer now that I'm prohibited from going to my office. I'm working through my feelings about being deemed non-essential with the help of my friends Stephen Colbert, Jon Stewart, Miller Lite, and chocolate.